I haven't played much with the Cool Treats stamp set, yet, so I thought today would be a good day. Now mind you, it's not because the weather calls for a cool treat....far from it. It's been frikkin' COLD this past week! I'm about ready for warmer Spring weather, how about you? 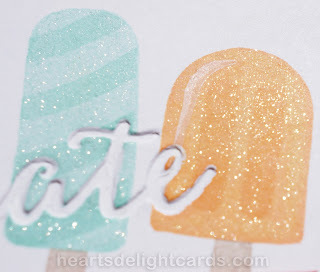 I just like the way the Celebrations Duo embossing folders are a great way to add some WOW to a card, and the Cool Treats set works so well with it. 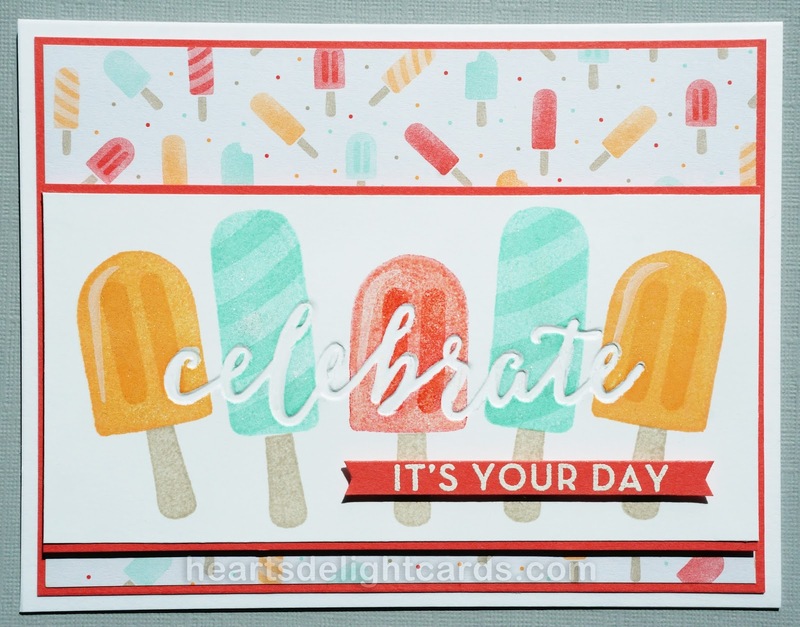 Because the greeting is debossed (indented rather than raised), it's perfect for over-stamping with balloons like this card, or the popsicles, as done here. It may take a couple tries to get the right amount of pressure for a good image, without getting too much in the indented parts. I saw a tip about leaving it in the embossing folder while stamping, but I haven't tried it, yet. I just touch up the ink spots with this extra-fine point white Sharpie. Some Clear Wink of Stella was added to give those frozen treats a frosty look. I'm sure something cold and frosty will be a lot more appealing in a few months, but for now I'll just admire the ink ones. Greeting banner: Watermelon Wonder 1/4" x 3"
Image panel: Whisper White 2-1/2" x 5-1/8"
Mat Watermelon Wonder 2-5/8" x 5-1/8"
DSP: Tasty Treats Designer DSP 3-7/8" x 5-1/8"
Mat: Watermelon Wonder 4" x 5-1/4"
Adhere DSP to mat and then to card base. 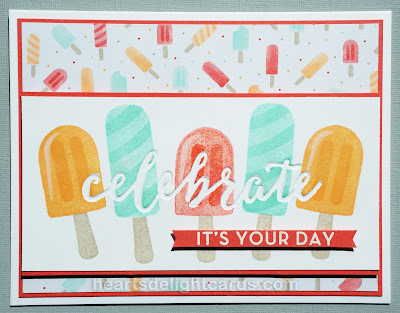 Emboss "Celebrate" in Whisper White, and stamp treats (ink colors listed below). Note: the Watermelon Wonder treat was stamped off once. Add Wink of Stella to treats, then adhere to mat, and attach to card base using dimensionals. Rub embossing buddy over greeting strip. Stamp greeting (from Big on Birthdays) using VersaMark ink. Cover with embossing powder, tap off excess, and heat with heat tool. Attach to card with dimensionals (cut in half).